XPL-1 series polarization microscopes are utilized polarize light to observe and research the matter which have double refraction features, the user can make single polarizing view, orthogonal polarizing view, cone light view. They are applied in geology, chemicals, physic and leechdom fields. They are also widely used to observe the crystal of liquid macromolecule polymer, biomedical polymer and liquid crystal. 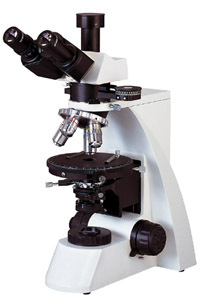 They are the ideal instruments for scientific research and universities teaching demo.